Prebake crust by covering the crust with foil or parchment paper and filling with rice or beans. Bake in oven for 7 minutes. Carefully remove foil/paper and rice/beans and prick bottom of crust all over with a fork. Return to oven and bake another 5-7 minutes. The crust should not brown, but only be partially baked. Set aside to cool and make custard. Turn oven down to 375 degrees. Beat all custard ingredients together with a whire whisk until well blended. Make filling by putting butter in a saute pan and put on medium high heat. When the butter foams, add the garlic and saute until lightly brown, then add spinach and 1/4 tsp salt and cook until spinach is wilted. Keep cooking until all of the liquid has evaporated. Remove from pan and chop finely. Put in a bowl and add 1/4 tsp salt, pepper, horseradish and creme fraiche. Spread spinach mixture over the bottom of crust and sprinkle with Swiss and Parmesan cheese. Cover with custard and bake at 375 degrees for 40 minutes or until the custard is set, puffy and golden brown. 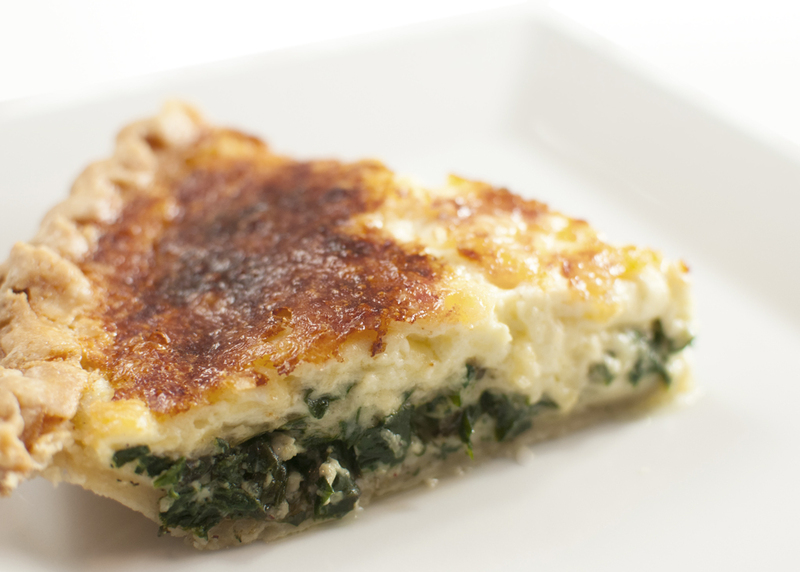 This entry was posted in main dish and tagged quiche, spinach.